In 1543, Andreas Vesalius, the founder of modern human anatomy, published De Humani Corporis Fabrica (The Fabric of the Human Body), what is now considered the most famous and beautifully illustrated of all early printed medical books. Later today, Professor Vivian Nutton of the University of Warwick in Coventry, England, will present the discovery of an annotated copy of the later 1555 edition that includes hundreds of Vesalius’ manuscript notes and corrections to the printer plates. 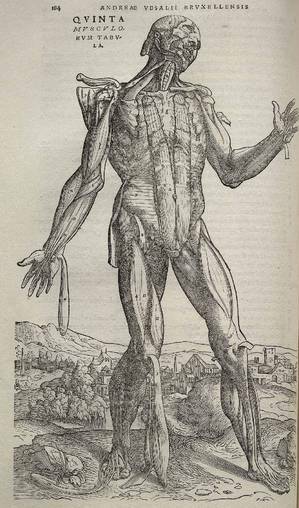 It seems the Flemish anatomist was working on a third edition of his magnum opus! The book is now on deposit at the Fisher Rare Book Library of the University of Toronto. A full description of the discovery and research done by Canadian pathologist Gerard Vogrincic and Professor Nutton will appear in the journal, Medical History, in October. More information is available at My Science. In 1543, Andreas Vesalius, the founder of modern human anatomy, published De Humani Corporis Fabrica (The Fabric of the Human Body), what is now considered the most famous and beautifully illustrated of all early printed medical books. Later today, Professor Vivian Nutton of the University of Warwick in Coventry, England, will present the discovery of an annotated copy of the later 1555 edition that includes hundreds of Vesalius' manuscript notes and corrections to the printer plates. It seems the Flemish anatomist was working on a third edition of his magnum opus! Needless to say, this is an amazing find, sure to interest scholars in many fields, particularly those in the history of science. And, as one collector put it, "The discovery of a copy annotated by Vesalius for another edition that was never published is about as good as it gets for rare medical book collectors!"